I am a true native of Drumbeg born in 1942 when my parents lived in the Quarterlands Road and except for a break of 16 years I have lived all my life in Drumbeg. My earliest childhood memories are of feeding the two Clydesdale horses belonging to our neighbour Sammy Dunlop. They were called Charlie and Jack and often grazed in the field across the road where the houses of Hambleden Park now stand and indeed where I now live. A ride in the cart behind the horses was great fun especially when Sammy handed me the reins for a short while. I loved this feeling of control which made me feel so very important. When we had shoes being mended I would visit Jimmy Stewart’s the local cobbler who sitting on a long bench opposite the window, hand sewed the lovely shoes that he made. His home with the shop above was a few yards from the Orange Hall towards Drumbeg corner. We did not travel far on holiday maybe a day at Newcastle or Portrush. Our big day was the 12th of July. For this each year I would have a new dress and sandals. Off we went at nine o’clock or so to the field (in a different place each year) where we had sandwiches and tea. After the parade was over we would have a lovely sit down meal in the Orange Hall prepared and served by the Ladies (wives or girl friends of the Orangemen). At around 9 pm the man with the accordion would start up the music and the adults would begin to dance. We tried to join in whenever we could. During the rest for the accordionist people were called to do their piece by singing a song. Well I remember Sandy Gray singing “The Lord Mayor had a Coach Man”, or Ricky Craig singing “The little Old Mud Cabin on the Hill”. Sometimes he played the spoons on his knees. Sammy Hanna sang “Danny Boy” and my father would sing “My Grannies old Armchair". This would have been for me the highlight of the evening. I just loved the old songs. Our neighbours were the Patterson family, Frank would pickle eggs and grow lots of vegetables. He kept bees and I was always sure of a slice of bread with butter and honey. Ronnie and I would make mud pies and place them in the hedges thinking the birds would use them for their nests. Water was carried from the stream at the the Hollow Brae near Drennan’s farm on the Quarterlands Road. 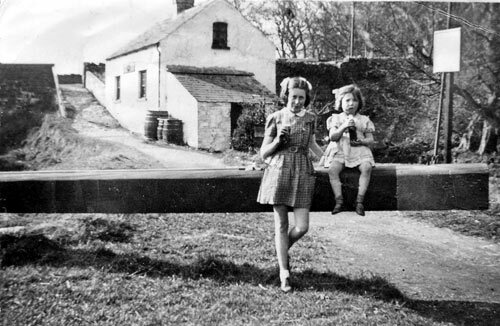 Off we would go with the old pram wheels with a board across, which we called “a guider” and fill the milk cans from the stream. As you can imagine this was fun “not a chore”. I would often ride my bicycle down to Drumbeg corner and leave it against the large oak tree at Mr. Ward’s house, catch the bus at the Corner and collect the bike on the way back. The tree is still standing at a garden in Lagan Wood. I loved to walk round the dam. The path started at the back of Thompsons Dye Works which is now the Hermitage, and ended at Sandy Gray’s farm where I climbed a little stile and followed the path down through where the Rural Cottages are situated now. On my way I enjoyed a drink from the spout as it was called. It was lovely spring water and lots of people would take a tin can or a bucket to carry water home from it. My granny lived at Crabtree Corner which now is the Rosbotham’s home. A path led up to Orr’s Lane, we called it the Guttery Gap. I would gather blackberries along this and sometimes I would get a ride on the ruckshifter belonging to Victor Elliott, this was great fun. This was before the M1 was built. Electricity was introduced to the Quarterlands in about 1952. Robert Allen an electrician from Ballyskeagh and a brother to my Uncle James Allen installed it in our house. No more Tillie lamps and eventually we got TV. Our bread was delivered by Bloomfield’s or Ormo. Oil for the primus stove would be delivered by Eric Irwin, in those days into an oil can not an oil tank. Ronnie Trimble delivered the Sunday roast, he had a butcher’s shop at the Dub. The fish man would call out “herring’s a-lay” fresh to-day! The Rag and Bone man (on horse & cart) collected rags and gave in return cheap household items – cups, plates etc. “Mr. Betterware” emptied the contents of his case for inspection out on the door-step. Potato gatherers would come out of Belfast on a lorry belonging to Lockhart’s. Mrs. Warwick sold buttermilk and country butter from her kitchen window at Beechgrove, the house is still there at the top of Barrack Hill. In the summer George Pedlow, Jimmy Kenaway and a few more came to tar the roads and cut the hedges and hedgerows. We called them the road men. My friend Joan Gardiner lived at the shop which sold groceries and sweets. I remember the day the first freezer was installed and everyone went for ice lollies. Joan and I would go for rides on our bicycles, sometimes both on the one bicycle. We would go down to the Lagan and fish for sticklebacks. The school holidays seemed to last forever. My mother was a dressmaker and she worked from home before I went to school. There were always people coming to have a fitting and I would stand beside the sewing machine and watch her. My dad kept a few pigs and it was great when the sow had a good litter because we always got a treat. I remember how hard they had to work and the long hours they worked but I had a very happy childhood. On Sunday night my mother and father would visit their friends Mr and Mrs McNally and the Abbott family, both living in the Quarterlands. Mr. Abbott senior had a lot of interesting stories and I loved to listen to him. I joined the church choir when I was about seven. I was not much of a singer but it was what most of the children did and the organist Tom Boreland was very patient with us. The choir would run concerts and perform in plays and we had a few good actors and singers. Although I wasn’t a very good singer or actress, I was a young student, learning to play the piano at Drum House, during the time Captain Orr and his family lived there. I learned to play on a Baby Grande piano, a great experience for any pianist. This talent helped me along in the choir, though I unfortunately didn’t keep it up. On Christmas Eve we went Carol singing round the parish, rang the bells at midnight and had supper at the Rectory. The Church choir held a garden fête a couple of years in Mrs Anderson’s garden at Ballyowen to raise money for the new organ. Roxaline Simpson also had a girls only choir which practiced in the Orange hall. Lots of girls from Ballyskeagh and Drumbeg enjoyed good times in it. I also enjoyed the Table Tennis club in the Parochial Hall and we had lots of matches with the neighbouring churches and also competed in the Church’s League. When I started work in the office of William Barbour & Sons I walked to work along Sandy Lane. This was in 1958 when the Sandy Hill houses were being built. The M1 was under construction. I remember how mucky Sandy Lane was and how many lorries passed me on the road. Mossvale beside the M1 was a right of way and when we needed to go over to Dr White in Dunmurry this was the shortest way to walk. My Uncle Matt Neill was the Sunday School Superintendent and would collect all of the children in his A30 car and take them to Sunday school. Hazel Shanks, Shirley Dugan, Kathleen, Bertha, Evelyn and Marty Campbell , Marian McCully, Daphne and Heather Shields, Ann Gordon, Rosemary Allen, Elma Adams and lots more children. Uncle Matt would also organize the Sunday school party. We had sandwiches and cakes and then games, my favourite was putting the tail on the pig. Matt would draw a pig on the floor and blindfold us and we had to put a tail on it, I think Kathleen Skelton enjoyed it the most. A thousand other memories throng my mind as I look back on those innocent days. and I am glad that much of the countryside remains as it was when I was a child.